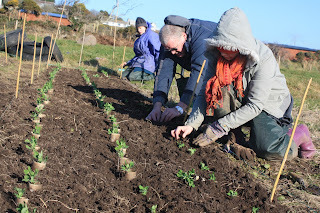 On Thursday 27th January a group of volunteers planted peas out on the vegetable field. The peas had been sown back in December, and had germinated and been growing in the polytunnel in module-trays since then, and needed to get outside to stretch their roots. Kent and Deb removing seedlings from the modules ready to plant. The pea variety we used here was "Douce Provence" bought from the Organic Gardening Catalogue (www.OrganicCatalogue.com - Garden Organic is a charity once known as the Henry Doubleday Research Association, and they have an excellent website full of information and handy hints), a hardy winter round-seeded pea. 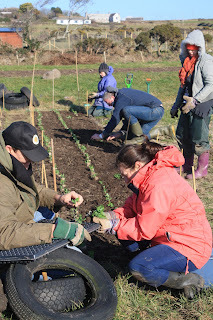 The day was chilly, with a northeasterly blowing, but a great time was had by all, and the peas are coming on well out in the field. The next variety we will grow is "Meteor", a very similar pea, before we progress to sowing wrinkled-seed peas when the weather is warmer, such as sugar snap and mange-tout. Jessica, Bob and Deb planting the pea seedlings. As you may see in the photo, one of our "module trays" was a home-made version, consisting of an old plastic dog basket filled with the cardboard tubes from toilet rolls. The tubes were stood on end, filled with potting compost, and a pea sown into each. The beauty of this system is that the cardboard tube can also be planted in the field, where it will rot down to nourish the soil, act as a mini-windbreak, and is easier to handle than squeezing seedlings out of the plastic modules - as well as using something which we'd otherwise just throw away (or put in the recycling, hopefully!). Once again we'd like to say a massive thank-you to all the volunteers who come and help on the farm, without whom not only would we struggle to do all the work necessary to make the farm a success, but we'd have almost no reason for existing in the first place. As a community farm we strive to involve the community in all we do, and we are here for the community, so when volunteers turn up to lend a hand it gives our work purpose, and we love having you here! 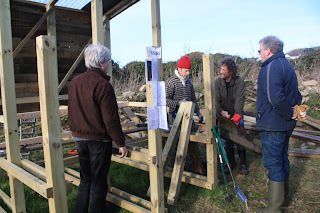 Building tree-bogs with Rob, Adam, Andrew and Bob. 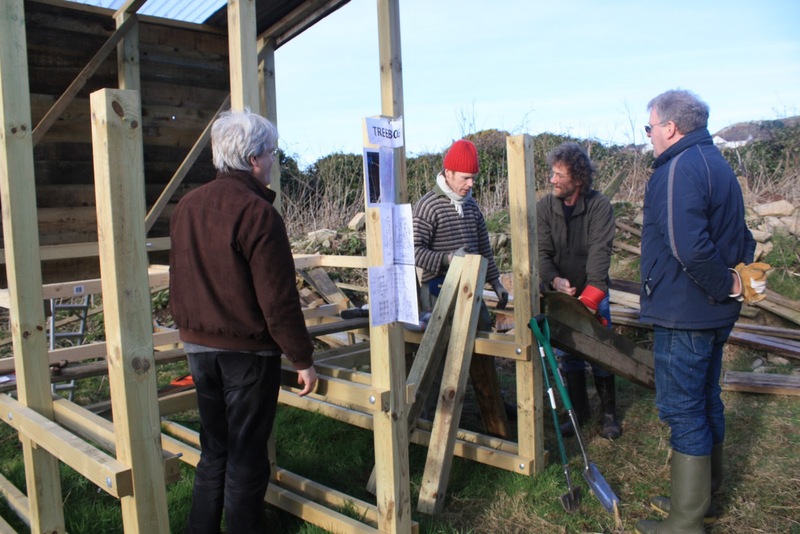 Over the past two volunteer sessions, we have cracked on with building the tree-bogs (see previous blog entry about this funky kind of compost-toilet), cut salad bags for Penzance Farmer's Market (held every Friday 09:00 to 14:00 at St. John's Hall), and cut back encroaching brambles on the field boundaries. 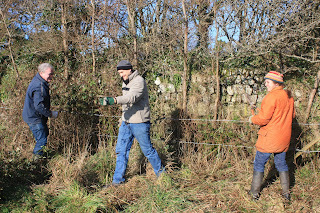 Bob, Kent and Kate loving cutting back those brambles. Upcoming volunteer sessions will involve digging the vegetable beds (once the ground has dried out a bit more) to sow peas and broad beans, and to plant potatoes, shallots and onions. We will also be aiming to finish the tree-bogs by the end of January ready for willow coppice to be planted around them on February 1st. If any of these tasks appeal to you, please drop in to our volunteer sessions, 10:00 till 15:00 Thursdays and 13:00 till 17:00 Saturdays. As daylight increases and more sowing of crops gets under way, we will be adding new times to these, so please watch this space for more details. 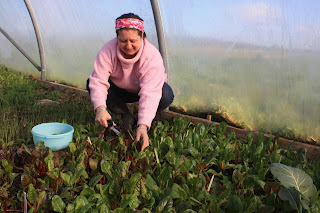 Deb cutting baby-leaf chard in the polytunnel. If you have any of the above that you wish to donate (or anything else which you think may be useful), please let us know on 01736 788454, or send an email to hughdtaylor@hotmail.co.uk. 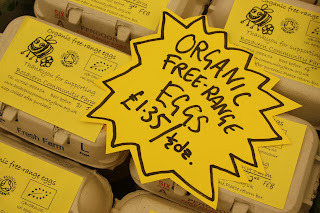 After several broadcasts on BBC Radio Cornwall through Friday and Saturday morning, we took our produce to Pendeen Farmer's Market for our first ever farmer's market stall. The market takes place every second Saturday in the centre of Pendeen, from 10am till 1pm, and has stalls selling vegetables, cheese, meat, fish, wool and knitwear, coffee and cakes, cheese, bread, eggs, and baked goods. 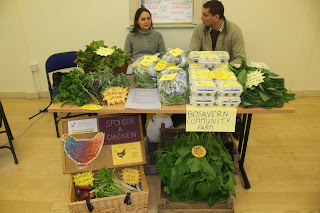 Two of the farm's regular volunteers, Alice and Kent, came to help run the stall. Our first attempt at a market stall. We were selling free-range eggs, salad bags, lettuces, red radishes and white "mooli" radishes, winter greens (both "pixie" spring cabbage and "raab" brocolli), "lattughino" winter lettuces, and sprigs of sage and parsley, plus our fund-raising chicken sponsorships. Lots of people came along to buy and chat and offer to help, so thanks to all of you, and we look forward to seeing you at the next market. Thanks to you, we raised £50 in the morning, all of which will go back into the farm to help develop the project. Delicious oriental white "mooli" radishes from the polytunnel. 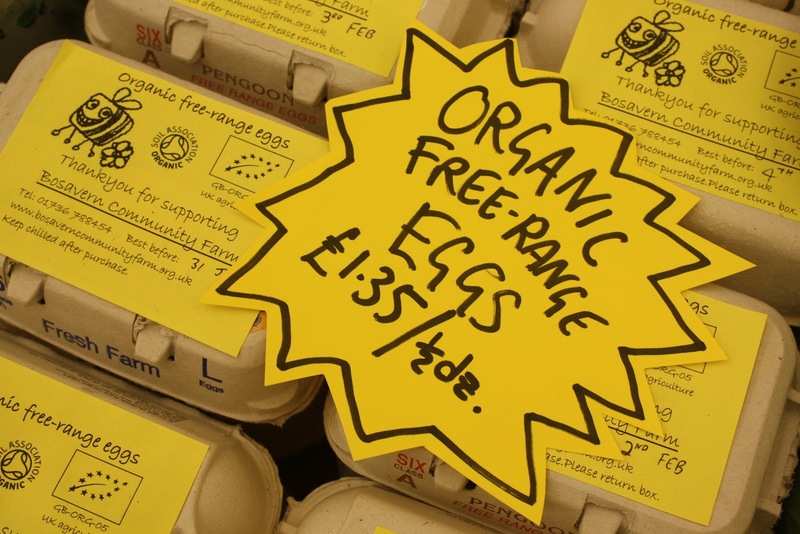 We are always excited by the positive and enthusiastic reception we receive at the market (having been twice in December to sell chicken sponsorships in the run up to Christmas), and we love hearing people's ideas and opinions about what we should be doing as a farm and a community group. Showing our new Soil Association approved labels. The next market is Saturday 29th January, and we hope to see you there. Bosavern Community Farm will be selling produce at the farmer's market in Pendeen this coming Saturday morning (15th January) between 10am and 1pm. This will be our first farmer's market as a stall-holder in our own right, and we will be selling salad bags (a lovely treat in the midst of winter), winter greens, radishes, herb sprigs, lettuces, fresh free-range eggs, and chicken sponsorships. Please come along and support us and other producers from the local area. The coffee and cakes from the coffee-bar are good too! 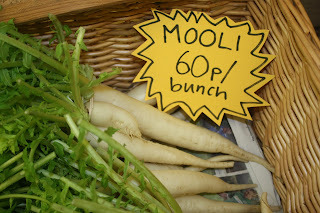 To find out more about farmer's markets please see www.wcfm.org.uk. A reporter from the BBC came to the farm this morning to do a piece on the project for tomorrow's breakfast show (Friday 14th January) so keep an ear open for that somewhere between 7 and 9am! Luckily one volunteer did come along despite the foul weather (thanks Kent!!) so will get his voice on the Cornish airwaves too. There may also be a piece about the farm on Sunday's weekly round-up. Once the interviews were over and the BBC had left, things returned to normal, and we busied ourselves for the rest of the day painting the farm's new roadside signs, repairing the rabbit fence for the upcoming growing season, and cutting salad bags for Penzance farmer's market tomorrow morning. St. Just Primary School Staff Visit. 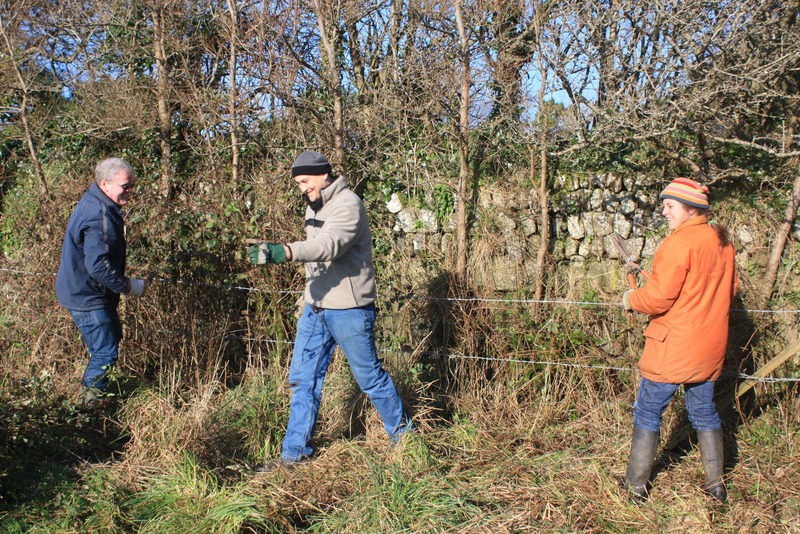 On Wednesday 5th January, braving the wet weather, the teaching staff of St. Just Primary School came down to the farm for part of their inset day, and to allow them to explore the farm's wide educational potential. After a farm tour, the staff split into groups to work on various team-building projects, such as planning and brainstorming sessions, logo design, farmhouse cooking, and compost workshops. There were lots of good ideas and positive energy flowing around, followed by superb quiches (using our own eggs) and salads (using our own leaves) in the farmhouse kitchen. One activity hatched from this day was a group of students spending the following Wednesday morning here on the farm as part of their economics curriculum, learning about the business side of farming, such as what produce we grow and how we market it - which goes to show that just about any subject can be taught here if we put our minds to it, from economics to trigonometry (planning a hexagonal allotment), horticulture to drama ("all the farm is a stage"), ecology to woodwork (our tree-bogs still need finishing!). Thanks to all the staff for spending their time with us, and we look forward to working closely in the near future.